For a family breakfast this morning, my mum requested pancakes. Me: Do you want thick or thin pancakes? Me: Ok! What size? Small or big? Me: Ok, what do you want to eat them with? I chose to make Nigella's American Breakfast Pancakes from How to be a Domestic Goddess, because they seemed like they'd be the right texture and size. 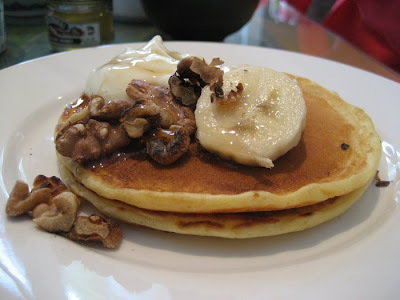 With the pancakes, we had maple syrup, bananas, Greek yoghurt and toasted walnuts. For those of you who are interested, maple syrup is a good source of manganese and zinc, and thus supposedly very good for your heart and immune system. (Not diet food by any stretch of the imagination, but much better than, say, white refined sugar). Bananas are low in cholesterol, and rich in vitamin B6, potassium, fibre and vitamin C. Yoghurt is high in calcium, and walnuts are high in omega-3 fatty acids, (source here). Omega-3's are essential for brain health, and a lot cheaper than salmon! Most importantly, the combination (pictured above), tastes great. 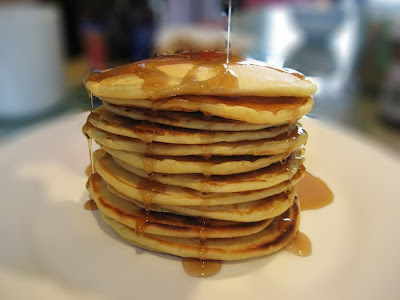 It's practically health food :) I love the idea of maple syrup and walnut on pancakes. Those pictures are gorgeous, btw!